I’ve been covering the San Francisco International Film Festival for ten years now for another web site. I’ve screened, reviewed and discussed well over one hundred films – some great, some good, and some real clunkers – and conducted numerous interviews over those ten years. This year’s festival, the 61st, runs April 4 through April 17, 2018 and features 183 films from 45 countries. In years past, I‘ve been able to attend multiple days and screen between 20 and 30 films. Circumstances prevented my attending but for a single day this year, so I was only able to screen a single film. Thankfully, it was a good one. Director Shana Feste, best known for the 2014 remake of Endless Love, decided she needed to make a film about three things she knew – rescuing animals, her father, and pot. All three are central to the plot of her latest film Boundaries, which is scheduled for a June release. That upcoming release prevents me from writing a complete review. Boundaries is a road movie featuring Vera Farmiga as Laura, a single mom who finds herself taking her recently expelled son Henry (Lewis MacDougall) along with her as she transports her estranged pot-dealing father Jack (Christopher Plummer) to live with her sister in Los Angeles after he was “expelled” from his Seattle-area retirement home. Originally scheduled to fly, Jack has other ideas and soon they find themselves driving down the 101 (more on this later), with Jack scheduling some stops along the way. Will there be arguments? Car trouble? Reconciliations? C’mon, it’s a road movie! And a well done one at that. Plummer is a delight in an atypical role, and it’s good to see veteran performers like Christopher Lloyd and Peter Fonda show up in cameos. Bobby Cannavale and Kristen Schaal have slightly more substantial roles as Laura’s ex and her sister. MacDougall is quite good as the artistically-talented but socially awkward teen. Feste’s script is lightweight but sincere, with a couple of laugh-out-loud lines. Plummer delivered one that had the audience applauding. With All the Money in the World done on incredibly short notice and this film, is there any question that Plummer, at age 88, is the hardest working film actor today? A post-film Q&A was held with director Feste, producer Brian Kavanaugh-Jones and Peter Fonda in attendance. Feste revealed that much of the film is based on her father who also made a cameo in the film before his passing. I had the opportunity to ask a “film geek” question about a particular shot in the film. They are traveling south from Seattle to Los Angeles, and one of their stops is in Sausalito. I noted that almost every film set in the San Francisco Bay Area has a shot of a vehicle traveling across a bridge, usually either the Bay Bridge or the Golden Gate. Invariably, the car is usually seen traveling in the wrong direction and, sure enough, in this film though they are supposedly leaving Marin on the 101 and heading for Big Sur they appear to be traveling north back into Marin. I asked the filmmakers whether they put that shot in to annoy people like me or whether there was a backstory. The director admitted she wasn’t familiar with the area (it was shot mostly in British Columbia) and good naturedly blamed the producer who is familiar with the area for the slip-up. Producer Kavanaugh-Jones admitted he was aware of the error and explained that problems with the vehicle (a Rolls Royce) limited them to just one shot, albeit in the wrong direction. Peter Fonda then chirped in that they had just reversed the negative knowing someone like me would catch it. The audience, who audibly acknowledged their own recognition of the mistake, seemed to enjoy the good-spirited interaction. 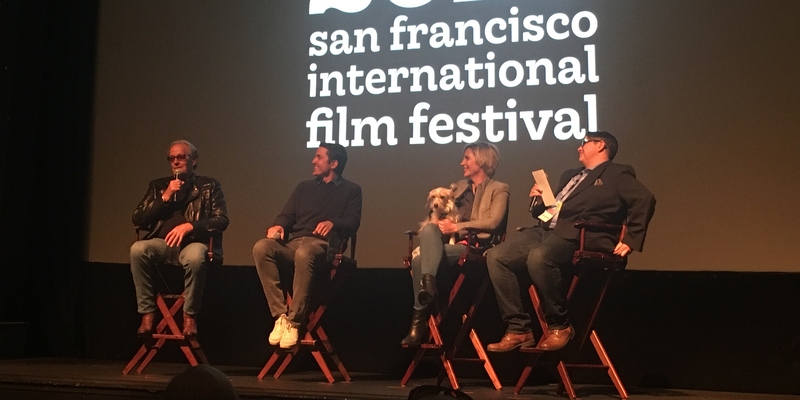 That’s one of the great things about the San Francisco International Film Festival – the numerous opportunities the audience has to engage with the filmmakers and vice versa. I’m looking forward to my 11th year of covering it.